New in version 6 are this pair of macros. They are found in the Cleanup Menu. The idea behind the macros is to make it easier to cleanup files yet retain essential font formatting. 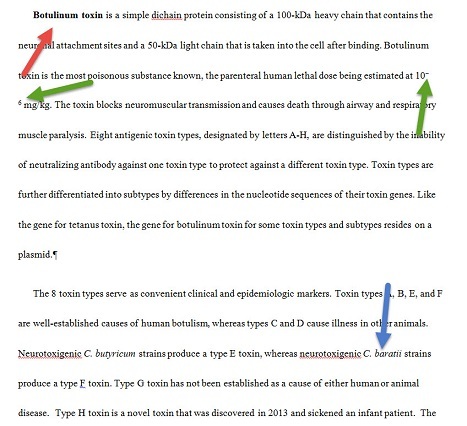 For example, if, as shown in the image below, a document has superscript (green arrows), bold (red arrow), and	italics (blue arrow) in it that you want kept, you cannot simply select the whole document (Ctrl+A) and then apply Word&apos;s Clear Formats command because doing so will remove the superscript, bold, and italics along with all other formatting. To clean out all of the unwanted formatting, yet retain some of the font formatting, can be a very time-consuming affair. This where Remove Formats can help. 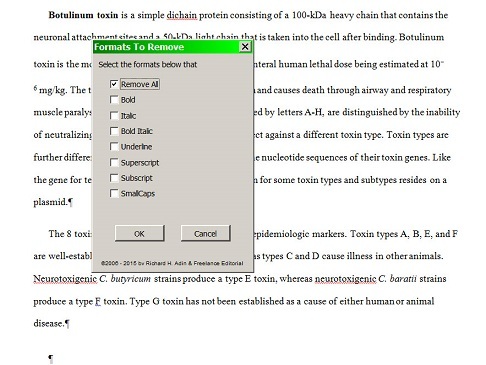 Remove requires that you insert a bookmark called format in your document. 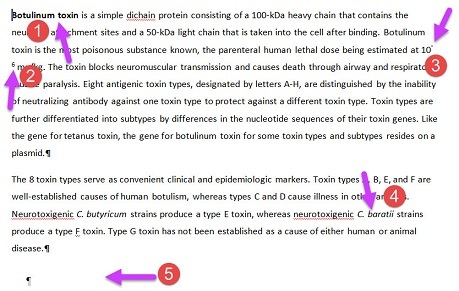 In the image below, the format bookmark (orange arrow) is being added by the Paragraph mark (blue arrow). 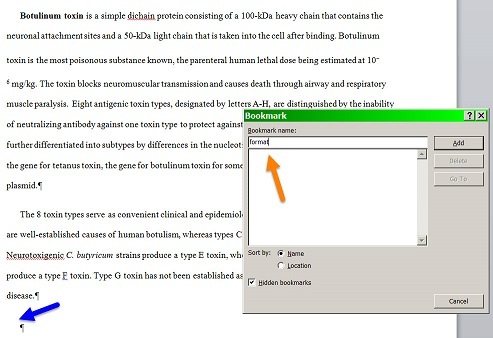 You use the format bookmark to tell the macro the end point for its operation. It can be any place in the document, including the very last item. The macro will run from the beginning of the document to the format bookmark. Any formatting that appears after the bookmark will not be included. After inserting the bookmark, you can run the Remove Format macro. Go to the Cleanup Menu and select Remove Formats, as shown below. Selecting Remove Formats brings up the dialog shown below. Here you can select which formats you want removed. The default is all. Remember that you are only temporarily removing these formats; these are actually the formats you want to preserve. They are being removed and substituted for so that they are not lost during removal of the formatting that you really do want removed. 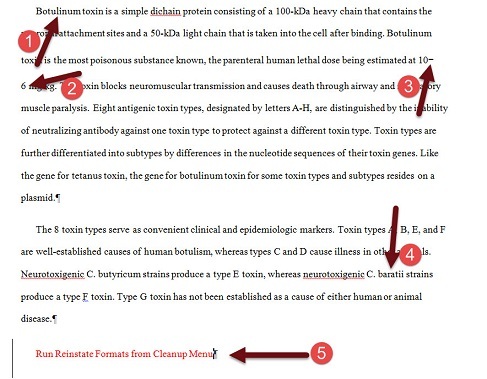 You can leave Remove All as the selection even if you do not have, for example, any underlining in the document. Why, then, have the ability to choose? Because your document might have, for example, underlining that you do not want preserved, in which case you would select the individual items that you do want preserved. Then when you remove the remaining formatting, the underlining will also be removed. The image below shows the material in our example after the macro has run. In the original text (see above), text #1 was bold, #2 and #3 were superscript, and #4 was italic. After running the macro, all of that formatting was removed. In addition, the macro inserted a reminder (#5) to run the Reinstate Format macro at the bookmark location. Now the rest of the formatting in the document can be removed however you wish, including by selecting the document (Ctrl+A) and then using Word&apos;s Clear Formats command. After finishing cleaning up the document, run Reinstate Formats from the Cleanup Menu (see above). Doing so will result in the restoration of the formatting you removed with the Remove Formats macro, as shown below. As you can see, the text at #1 is bold, #2 and #3 are superscript, and #4 is italic — all of the formatting we wanted preserved has been preserved. In addition, the reminder has been removed (#5). Yet, as you can see by comparing images, the other formatting in the text has been removed. The Remove Formats and the Reinstate Formats macros are designed to make it easy to remove unwanted formatting while preserving common font-based formatting. They are especially useful when you need to apply a template to supplied text. Cleaning out unneeded formatting before applying template styles assures that there is no conflict.